DS: I would say Coach McBride. I’ll never forget him, the Defensive Coordinator and D-line Coach. He’d always meet with the D-line in the shower stalls. I was never really a part of that, but he would always talk to us. And I’ll never forget some of the quotes, but a lot of times he’d say to us individually, “Each one of you guys have your mom, your dad, your uncles, your aunts, your grandparents sitting in the stadium today. We do not want to let K-State (or Colorado or whoever we were playing) come into our house and beat us. It’s actually an embarrassment to you and especially your family members who love you, who are out in the stadium rooting for you today. I just want you to thinking about that.” Basically, we’ve got to be prepared. We prepared all week. You’re gonna play well, but don’t let these guys come in and embarrass you in front of your family. I’ll never forget that, it was something else. I remember him also saying, “The quarterback? I want you guys to be all over him like Jack the Bear.” (laughs) I don’t know why he said that -Jack the Bear- but I’ll never forget it. Kind of funny. (laughs) I tell you one thing with him, I had a lot of respect for him. He was kind of intimidating a little bit with his presence, but very confident, and he had a whole lot of respect from the defensive team. Very intense. You didn’t want to cross paths with Coach McBride. Another person I’ll talk about, too, is Kevin Steele. He was the linebackers coach, and if I recall I think he played for Johnny Majors at Tennesseee, I think. But he was very, very intense. I remember him almost kind of like a drill sergeant getting in front of the linebackers: Terwilliger, Phil Ellis, Ed Stewart, those guys. He’d get right in your face, an inch from your face and scream at you from the top of his lungs. I tell you, he’d correct you when you were wrong, but he’d be your best friend and back you to the hilt when you were in trouble and what else. You just kind of had to learn to work and operate with him. That’s just my view from the side, but everybody saw and noticed it. One of the things I’ll never forget, when he moved on and I was watching the game and he was in the face of Kevin Greene, the pro linebacker, and was yelling at him, and I think Kevin Greene got mad and yelled back and grabbed him or something. And it’s just my interpretation, but maybe that was a sign for him that maybe he should get back into the college game. (laughs) But he was a neat guy, he really was. Intense, in-your-face kind of guy, a drill sergeant. Q: From ’91 to your senior year of ’95, how would you say the team dynamic changed, if at all? DS: We were basically 9-2, 9-3 my redshirt freshman and true freshman year, and honestly, we were satisfied at that time with winning the 9 games. You know, Coach Osborne won nine games in a row for over 25 years and never won less than that, and we were just kind of continuing on the tradition, but there was something that was missing, not having won the big one. Looking back, that’s where I think honestly having the players come in like a Tyrone Williams, a Tommie Frazier, Christian Peter, those kind of guys right there were the ones to kind of put it together and said, “We’re taking it to the next level and we’re winning every game.” That group of players, I would say in general, those were the ones who really stick out and made it happen our junior and senior year when we were undefeated back-to-back national champions. It was basically about having no doubts, our confidence level was raised. And they had the presence to raise the confidence factor of every member of the team to play to the best of their ability each and every play of every game we had. Losing was not even a thought in our minds, not even a speck of a thought in our minds. We knew going into these games that we were going to win. We just had to execute and do what we did in practice, study our films, take our tests. You know, we had to get 90 or 95% on our test each week for who we played, and we knew what we had to do. And being a part of it, I could see it evolving as we went through. I think that was the biggest thing looking at it from the 10,000-foot view. I just think we were satisfied with those nine win seasons my first few years, and some of those guys who came in decided we were going to take it to the next level and raised the bar. We had some superior athletes, changed up some of the defensive schemes, went faster by putting some of the outside backers… the Ed Stewarts’, Jamel Williams’, Terrell Farley, those guys were extremely fast. And we were so strong at the running back positions, and finally put together an incredible defense and amazing offensive records, racking up 400-500 yards per game those years. Looking at it now, it’s been on ESPN’s Top Teams of All Time -the ‘95 season- and it’s interesting to look around and compare it to other teams. It’s always at the top every year. Q: Do you have a favorite game you played in that stands out to you? DS: I would say it was probably my senior year when we played Missouri in Lincoln. We beat them like 55-0, I believe. It was a blowout. I was a left cornerback and the backup quarterback for Missouri at the time -I was in Cover 9 and basically was kind of backpedaling into the end zone- and the guy threw a pass. And the receiver was not around and I got an interception in the end zone to preserve the shutout. They were getting ready to score and we held them. That’s probably one of them. Q: And as far as the bowl games, anything really stand out to you there? DS: I would say probably the first year winning it in ’94 in the Orange Bowl. What stands out to to me was the emotion in the locker room after the game. Reality had hit us. We really couldn’t believe it, beating Miami in the Orange Bowl on their home turf. 24-17 was the score and having the players realize that we made history, we were 13-0 and national champions and all the hard work paid off. And it was just kind of a great relief to see it was over with, and then kind of a great joy to be part of Osborne’s first national championship. I know he was just as excited as we were. And you just can’t beat beating Miami in the Orange Bowl on their home turf. That was part of it. And we were on top. That was great, really a phenomenal time. Q: Darren, I would suspect most guys, after finally reaching that spot, most people would sit back and lose a little bit of fire and not have as much of it the next year. How would you say we dealt with that, from a player’s perspective? DS: That’s a great question. I would say overall we worked really hard from the ’93 season where we had that Florida State loss by two points and just said that it wasn’t going to happen again. We got so close, but we dropped the ball, didn’t get it done. We saw what it took to be national champions. We lost some players, but we had some good backups that were filling in the holes. We still had Christian Peter, we had Tommie Frazier back, Tyrone Williams, we had some great offensive linemen with Stai and Wiegert, but we had some other players that stepped in: Steve Ott started, Aaron Graham those two or three years, Eric Anderson at right tackle, it was something that we really just wanted to continue it on. We knew what we had and we wanted to repeat again. And honestly, we looked at it going into that ’95 season that we were not going to lose again. We were playing very well, blowing people out. I remember on the defensive side we had goals, a little laminated sheet of the goals for the ’95 season. I remember some of the goals of the defense was to keep the total yardage to 285 yards or under for the opponent. Another goal also was to have three turnovers per game, so those were little things to look at. And of course, we were averaging close to 500 yards or so on offense, so if we could keep the opponent under 285 (and a lot of times we held them to 250 or 225 total yards) which, “Hey, if you keep them off the field and you get yards, they can’t score.” And we had the running game and used the time clock, so that was an advantage, too, because of time of possession. Those are things that really stick out. We were on the high point my junior and senior year, and it was business as usual. We had t-shirts made up that said, “Business as Usual.” The previous years were, “We Refuse To Lose,” then it was, “Unfinished Business,” then it was, “Business As Usual,“ if I recall correctly. Looking back at that, realizing what we accomplished? At the time I didn’t realize just how significant it was. I knew it was good, but as time has gone on and I’ve gotten kind of older and looking back, it truly is amazing what we accomplished at the time. It is just so rare to see teams go 25-0 over two years, 36-1 over three years. We dominated the ’90’s. 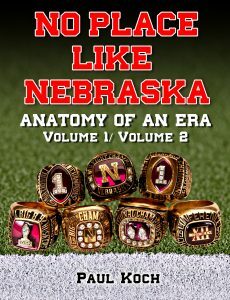 We really did, and when you look at what Coach Osborne did with never winning less than 9 wins a season, that’s just something. 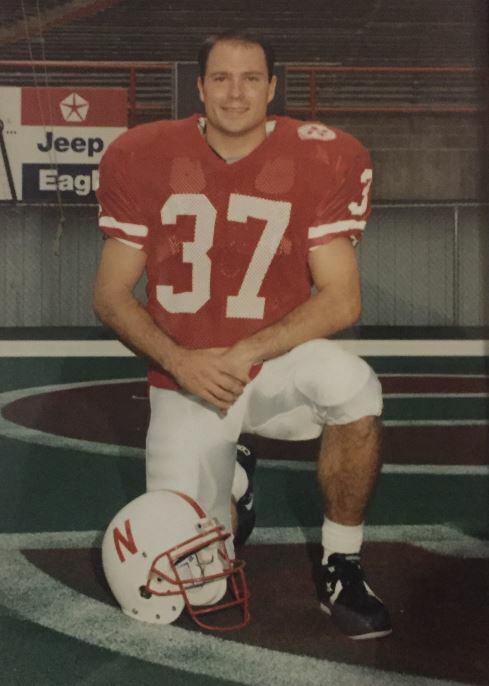 And me coming from a small town, I played a lot more than I ever thought I would, as a Nebraska walk-on. And to be associated with that caliber of people? Those guys, it was fun watching all those guys we played with play in the pros for the years, too. That was neat seeing that. It really taught me a lot of things about life: the fact that you never give up. I was on the scout team for two years and that second year it was kind of wearing on me. I had thoughts of quitting the team, but I was the kind of person who could not live with myself if I quit the team, and in my mind that just wasn’t an option. And I’ve got 9 football rings: the ’92, ’93, ’94, ’95 Big 8 championships and 2 national championship rings from ’94 and ’95, and my letterman rings. It’s really kind of a neat thing to show off to friends and family. DS: Yeah, probably some things I couldn’t tell you. (laughs) I’ll just say one thing: there were some interesting practices that some of the different positions had at initiating freshman. Especially the defensive line, that was probably the worst. 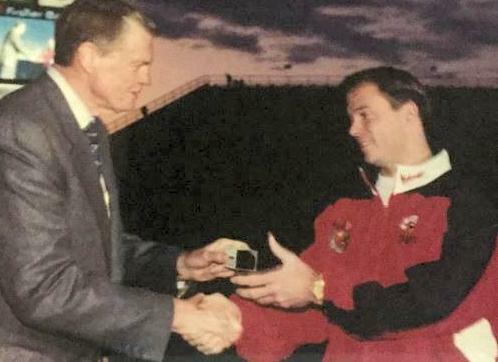 I always remember after practice Coach Osborne running around Memorial Field, doing his three miles alone in the stadium. Overall, the practices were really well organized, every move we made was filmed, it was a complete practice. We had meetings at 2 p.m., were always dressed and out to the field by three-thirty, practice from 3:30 to 5:30-5:45, lift weights for another half hour, then we’d shower, go eat, and then study hall. So there was a full, full day. I remember thinking about that. We didn’t have time for extra-curricular activity because we were exhausted after a hard day’s practice. And then you had class the next morning at 8 o’clock. DS: That’s a good question. I think overall they may have that perception that we had it all. We had a nice weight room, nice locker room, you’d get to eat prime rib on the special occasions at the training table, but I don’t think they realize the time commitment involved: the practices, the studying, the classes, the meetings, the quizzes, the preparation behind it to make it happen to become champions. There was a lot of effort and time put into it, a lot of training. Those coaches on the football team? When it’s football season those coaches are working around the clock. Of course, my brother was an Undergraduate Assistant Coach (he played for two years and got hurt and became a coach), and I remember him going in on Sundays at 8 a.m. and sometimes not coming home until 6 or 8 at night. He would make cue cards for the scout team to run that coming week, of the teams we would play. He’d draw all of them up. He’d work 8 or 10 hours on Sunday, that was his deal as an Undergraduate Assistant Coach. Granted, there were a lot of good things that were provided to us, but the football team brought in a lot of revenue for the University, and today it covers a lot of other sports like swimming, diving, whatever else, helps to finance them. And it’s something I’m sure will always continue to be big. Some people from out of the state ask me, “Why is football so big?” Well, there are no other big teams. You’ve got corn, you’ve got cattle, and you’ve got Nebraska Football. It’s an agricultural state and we’ve traditionally been a great team over the years, and people from way out west in Scottsbluff or Chadron that would make the 4-5 hours trip every week to go the games, packing I-80? Those are Cornhusker fans. Then you have fans like my grandmother, going to the games for over 50 years, and she was 82 and was bound and determined to go to as many games as she could until her last day. I remember her walking out of the stadium with tears in her eyes knowing she wouldn’t see it again. I‘ll always remember that. She was a huge supporter, a true die hard. Something I enjoyed, playing for her. And I’m introducing my kids to it now. They’re a little scared of Lil’ Red, but they’ll get used to him. Q: Would you point out a certain person behind the scenes who played a huge role? DS: Many different people were a big part of it. There are a couple: Sully was a big part of it, and Doak, as well, back then. Different people. Those people were really pivotal in providing the best care for injuries and rehabilitation and getting guys back on board, and then on the training table side. And also, I remember Keith Zimmer with mandatory study hall for true freshmen, which I think is a fantastic thing. In high school you didn’t have to study much, but there you do. It was setting up tutors, all of that. Then we had such a high degree of graduates and Academic All-Americans over the years. It’s hard to say any one, because everybody kind of pulled their fair share. Another coach a lot of players really liked was Dan Young, a lot of people had a lot of respect for him. He grew up in the small town of Primrose, just a short ways from Albion and Petersburg. So it’s tough for me to pick any one person. Coach Osborne was just really good at getting great people to work underneath him. Everybody had their own unique ability, all very focused and dedicated to the players and would give the shirt off their back to you. We spent a lot of time together over the years in practices, meetings, traveling, I have a lot of fond memories. I’m really glad looking at it from being a Nebraska kid, to dreaming and playing for them. I actually did it. I had some offers at some other schools I could have taken, but it wasn’t about that for me. I knew where I wanted to go and I knew where I belonged. I wanted to be a part of the Nebraska Football team. It’s something that -the timing of it, I have to thank my parents for that- but the timing of it was perfect for those championship teams. (laughs) I have no regrets. I’m glad to have associated with the coaches, the staff and the players, and it’s really helped me with my career. Helped me get my first job, just letting them know during the interview that I was a walk-on and had to pay my own way and be dedicated and be a part of the team. That kind of conveyed to them that I’d be a good worker. DS: Hard work, and realizing that it’s the little things in life you have to do to make a difference, some things that are very true today. You don’t go long in life just doing the status quo, you have to make it happen, you want to be a leader and take charge. That’s something that allies to my personal life and my career right now. Q: Anything I haven’t brought up that you think set those teams apart from others of their day? Any grand revelation we haven’t touched upon? DS: I’m gonna have to really go back to looking at some of the players. The two that really stick out in my mind as being pivotal to the confidence and leadership of the program were Tommie Frazier and Christian Peter, those two guys. Tommie was on the offensive side and Christian was on the defensive side. A funny story I’ll tell you about Christian Peter: we were playing Michigan State, it was in East Lansing. And right before the game Coach Devaney was there (because he’d coached at Michigan State years before, I believe), and he was gonna give us a pep talk. And typically the coaches leave the room and the captains get up and give us a pep talk and fire us up. Of course, Devaney was a little older at the time and he ended up speaking to us, but it was one of those things where Christian and the captains were doing their thing, getting riled up. And I remember Christian grabbed this clock off the wall in the locker room and breaks it over his head, and he cut himself and he was bleeding down his face, and he just kept on going and talking about, ”We’re going to beat these guys!” He almost looked like a WWF wrestler, blood was coming down and it didn’t even faze him, the plastic on the front part of the clock broke on his face and cut him. He threw the clock in the trash can, put his helmet on his head and away we go. That locker room was going crazy after that, it was funny. Overall -to answer your question- the type of people, the caliber of people on the coaching staff with Coach Osborne: we believed in each other, we cared about each other, and we knew what we had to do to take care of business. We were extremely unified as a team, took one game at a time to win every game, and that’s what we did. It really never, honestly, crossed our mind that junior and senior year at all, of losing. I really believe that if you believe and have confidence in yourself that you’re going to win. You’re going to win. And if you think that way and prepare that way, that’s what’s going to happen. If you’re the other guy who is a little wishy-washy and goes into things with that attitude, you might lose. But being focused and driven and knowing what the end goal is, that’s what you keep focused on, that prize, that championship trophy, for us. And Tommie and Christian stood out to me from the players’ perspective, getting everybody to jump on the boat and saying “We’re gonna beat everybody one game at a time.” They were incredible about rallying the whole team from freshmen to seniors, believing that we were unbeatable. And honestly, that’s exactly how it was. Losing was never an option. Q: I haven’t heard much about Tommie’s motivation and leadership. Any examples come to mind? DS: Christian was a lot more vocal than Tommie. Tommie would say some fiery things, but he was more of a silent, confident leader. My impression of him, how he carried himself? Basically his confidence in watching him operate with this offensive line, he had the trust and the belief in his offensive line to block for him like they should. He was very motivated and competitive -not as vocal as some- but there was something about him. Just in looking at him and watching him operate, he had an incredible amount of confidence about it, and I think it carried on to other offensive players on the team. We knew that when Tommie was behind the center, we knew we were going to win. The same thing with Brook. We had confidence with him. And I’ll never forget the day he passed away in the plane accident and all of us going to his funeral was quite a deal. But overall, just looking at those two guys from my perspective, Tommie being the quarterback, the leader on offense and producing 500-plus yards or whatever it was. When Tommie was on the field everybody raised their level of play two notches, to the highest degree they could. There are other players, too, but those two really stand out to me, their presence on the field, ‘I can’t let these guys down. I have to do my part. I have to be focused and follow through on the tackle, make sure I catch all the balls thrown to me.’ That’s my interpretation. Darren’s reminding us of the mantra “Remember Iowa State” makes me wonder if every champion needs to at some time or another go through a crushing loss, a humbling & pivotally embarrassing experience to drive him or her in future endeavors. “It was a real eye-opener, a pivotal turning point for our teammates to see what we had to do and take care of our business each and every week and not to look over any team that we play.” Funny how he brought that up out of the blue, but I think the ’93 team and thereafter benefited greatly from that ’92 defeat at the hands of the lowly Cyclones in Ames. Revolutionary patriot Thomas Paine once penned, “What we obtain too cheaply, we esteem too lightly; ’tis dearness only that gives everything its value.” That’s common sense.